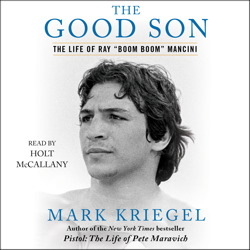 From the bestselling, critically acclaimed author of Namath and Pistol comes another remarkable biography—the life of Ray “Boom Boom” Mancini. In the early 1980s, Mancini was more than the lightweight champ. He was a national hero. Sinatra fawned over him. Warren Zevon wrote a tribute song. Sylvester Stallone produced his life story as a movie of the week. After all, an adoring public considered Boom Boom the real Rocky. Lenny Mancini—the original Boom Boom, as he was known—had been a lightweight contender himself before fragments of German mortar shell almost killed him in 1944. By winning the championship just as he vowed—for his wounded father—Ray produced his own feel-good fable for network television. But it all came apart in a brutal 1982 battle against an obscure Korean challenger. Deuk Koo Kim lost consciousness in the fourteenth round and died within days. Three months later, his despondent mother took her own life. The deaths would haunt Ray and ruin his image, turning boxing’s All-American Boy into a pariah. Now, thirty years later, Kriegel finally uncovers the story’s full dimensions, tracking the Mancini and Kim families across generations and excavating mysteries—from the killing of Mancini’s brother to the fate of Kim’s son. Even as the scenes move from Youngstown to New York, Las Vegas to Seoul, Reno to Hollywood, The Good Son remains an intimate history, a saga of fathers and fighters, loss and redemption.